WORLD FARE: Authentic, or not, at Szechuan Taste? Authentic: It’s a word we think we understand. Take “Chinese food,” for example. We think we know “authentic Chinese” right up until we realize that deep into the ’60s, chop suey was the hallmark, though chop suey is hardly a Chinese dish at all. And then there is Szechuan Taste (8199 Clairemont Mesa Blvd.) in the Convoy District. Just a decade ago, the only requirement for Chinese food to be seen as authentically Szechuan was the presence of incendiary heat. Then something happened. One part was branding; particularly the change in transliteration of the Chinese word from “Szechuan” to “Sichuan.” The other was the notion of ma la, which translates as “numbing and spicy,” and is the combination of fiery, earthy chili peppers and tingly, flowery Sichuan peppercorns. Suddenly, the notion of authentic Sichuan changed. What you get is a dish not entirely unlike Szechuan Taste’s thinly sliced marinated chicken appetizer. The chicken itself was flavorful. As soon as you realize that, though, the numbing force of Sichuan peppercorns and explosions of spicy heat from the chilis blows your palate open. Unfortunately, salt also came to the party and overwhelmed the dish. The Dan Dan noodles—a member of the Sichuan Top 10 Hit Parade—was another example of the same: great flavor, great ma la, but far too salty. 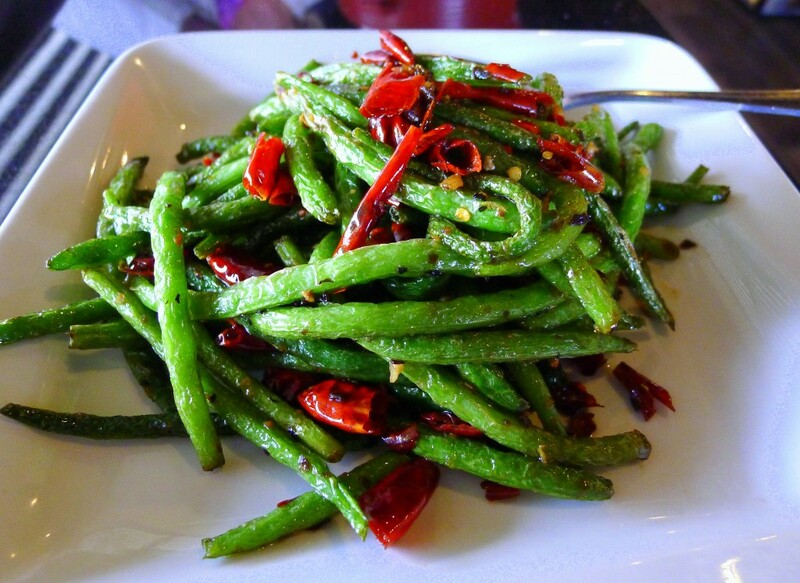 The dry-cooked green beans was a much better dish. “Dry-cooked” is, of course, a misnomer, at least unless somehow chili oil is considered dry. And that oil, along with the presence of dried red chilis, was a huge flavoring element of this dish. But the toasted and ground Sichuan peppercorns were an equal partner in the affair and this dish, more than any before it, revealed the genius of ma la. Those Sichuan peppercorns opened up the palate, readying it for the heat. Beef noodle soup showed a different angle on Sichuan. This wasn’t phở (Vietnamese beef noodle soup) with all of its Frenchy elegance. No, it was phở’s evil twin, a dark and brooding thing in which the ethereal ma la magic is transformed into something far more muscular. It was powerful. One of the best dishes at Szechuan Taste was one that is not exactly classic Sichuan: wild chili-shredded pork. Instead of being about the balance of heat and numbness, this dish was about the balance between the heat of the stir-fried jalapeño flesh and the savory qualities of the pork bits. And sure, the chili pepper brought heat, but this dish also highlighted the vegetable qualities of the pepper. Szechuan Taste may not be authentic Sichuan. It certainly isn’t perfect. It has a long menu that doesn’t stick to a single theme (dim sum dishes alongside “Cantonese favorites,” as well as Sichuan). But it is beautifully built-out, and serves food that’s flavorful. It may, in the end, be an authentic example of Chinese food in America today.